Principal of Central Elementary School. Follow her on Twitter @dot2teach. Vary the length of responses in your lessons. For example, sometimes assign a quick write and other times assign a prompt that requires the students to give an extended response. At other times give students a chance to revise, edit, and score their work. For extended response prompts, give students the opportunity to respond to a variety of media types (including written text, video and audio recordings). For example, ask students to read a narrative and listen to an audio diary on the same topic. Then, have students respond to a prompt that requires them to use textual evidence from both sources. Emphasize re-reading and close reading. Have your students practice gathering the meaning of unknown words through the use of context clues. Suggest using phrases like: the author said, in paragraph 3, according to the text, etc. Use a wide range of terms when preparing writing prompts, e.g., article, excerpt, text, selection, key idea, central idea, and theme. Have your students underline the direction words in a prompt before answering in an attempt to clarify what they are being asked to do, e.g., support, discuss, describe, interpret, respond, summarize, explain, articulate. Teach a unit of response writing using all text types early in the school year, thus making it easier for students to write quality responses across the curriculum all year long. Teach a mini-unit of response writing lessons during each text-type unit, e.g., 3-5 lessons during the Narrative unit, 3-5 lessons during the Informative unit, and 3-5 lessons during the Opinion unit. Don’t forget the RACES writing strategy that helps students write a quality response that is supported by textual evidence. 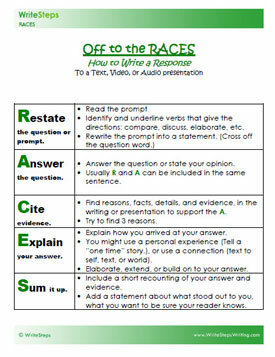 The visual aid, “Off to the RACES: How to Write a Response to a Text, Audio, or Video Presentation” is a useful framework that will help your students remember the steps of writing a thorough response. Katie Holder, a first grade teacher, shares the personal dictionaries that her students use during Writing Workshop. Want your dreams to come true? 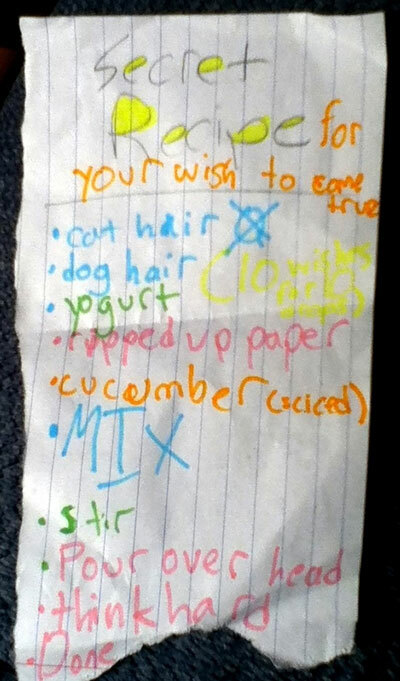 Follow this recipe! Do you have a funny student writing piece you can send us? If so, send it to [email protected] to be featured in an upcoming eNewsletter! We’d like to welcome Jean Wiley, Support Specialist, to WriteSteps! Jean’s role is to connect school administrators and teachers to our Awareness Ambassadors. Jean lives on a farm in the Lower Peninsula of Michigan raising cattle and chickens. She enjoys gardening, kayaking, traveling, and also hunts white-tailed deer with her husband. We welcome Jean to our team! Heading to the conference early? If so, register for “Blend the ‘Write’ Stuff” on Wednesday, March 9, from 1:00 p.m. to 4:30 p.m. located in the Gallery Overlook A. The cost to attend the pre-conference workshop is $85.00. This unique approach to the Writer’s Workshop allows flexibility for anytime/anywhere student learning. Engaging options for publishing student work using online options and apps will be demonstrated and practiced. Gain more time to coach and conference with students using this blended approach. Increase actual writing practice across all genres and prepare learners to participate in state assessments. Joanna presents “Blending Your Writer’s Workshop” on Thursday, March 10, at 10:00 a.m. in the Ambassador West (Amway) room. Blend or flip your Writing Workshop! Students control the time, place, path or pace of learning. Gain time to coach and conference with students, increase opportunities for writing practice, and prepare learners by giving them the technology experience they need to participate in next generation assessments. Attend “Blended Learning Bonanza” on Thursday, March 10, at 2:30 p.m. in the Ambassador West (Amway) room. Fully integrate your technology to maximize your 1:1 time with students! Come see how Joanna blended all subjects in her elementary classroom to provide students with differentiated instruction and learning 24/7. Her students were self-directed and practiced 21st century skills on a daily basis, including Genius Hour. Joanna will share her journey and transformation with you by bringing you into her classroom to see how it worked. You can do it too. Kathleen Schutter will be at the Kentucky Society for Technology in Education located at the Galt House. Stop by booth #13 and say hello. She will be there to answer any questions you have regarding our award-winning, K-5 writing and grammar program. Awareness Ambassador Ben Kutz is going to be at the Missouri Association of Elementary School Principals Conference. Stop by booth #20 to learn how we can help improve writing and grammar at your school! Principal Kim Rodriquez will be presenting, “Write to the Top-Essential Tools for Assessment Success,” on Monday, March 14 at 8:00 a.m. in Room 63. Kim Gates will be at the North Carolina Reading Association Conference. If you’re attending, stop by the WriteSteps booth #16 and enter to win a one-year free trial. Kim will also be presenting, “Off to the RACES-Response Writing,” on Monday, March 14 at 12:15 p.m. in Room 301A. Don’t miss it! Herman Humes will be at the California Charter School Association Conference located at the Long Beach Convention Center. If you’re attending, come to our booth #849 and take the time to learn more about WriteSteps! Don’t miss out on this presentation! Kim Gates is presenting “Off to the RACES-Response Writing” at the Michigan Reading Association Conference at COBO Center on Sunday, March 20, at 8:00 a.m. in Room 311A. She will be exhibiting during the conference at booth #20 too. Stop by the WriteSteps booth at the ASCD Annual Conference and say hi to our National Presenter, Kim Gates, and Awareness Ambassador, Ron Cox at booth #1029. They will be able to answer any questions you have about WriteSteps. We look forward to seeing all of you there!